I was on a roll for a while, turning out regular blog posts to keep my nascent audience entertained. And while I write this blog for the dual joys of cooking and writing, the ever growing number of hits showed that all my effort was not for nothing. Then came the past few weeks and…silence. It’s not that there’s nothing to write about; I’ve been busy. It’s just that there hasn’t been time to write is all. So, traveling in the way-back machine, let me tell you about an awesome dinner Tania and I had several Sundays past. My ancestry is Swedish-German. Somewhere along the way though, and I’m not sure where, a really good recipe for spaghetti and meatballs worked itself into my family’s repertoire. (Is it just me, or is the word spaghetti hard to remember how to spell? It’s definitely one of those words that I misspell just about every time I write it.) Lest you be confused, these are meatballs of the Italian—not Swedish—variety. I find that the winter time is a great time for spaghetti and meatballs then. For one, I’m usually spending a lot of time inside. 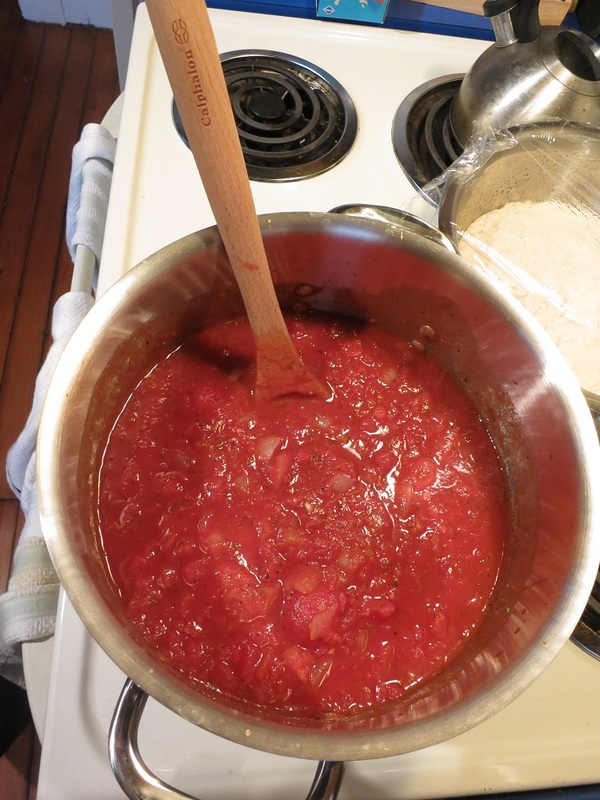 Also, the recipe for sauce is a great use for canned tomatoes. So, with the fresh farmers market tomatoes of summer a distant memory, spaghetti sauce is a great way to incorporate some delicious tomatoes into your diet. Really, that’s all the sauce recipe is: canned tomatoes and spices. See for yourself. And while you could certainly make spaghetti sauce without the meatballs, where’s the fun in that? 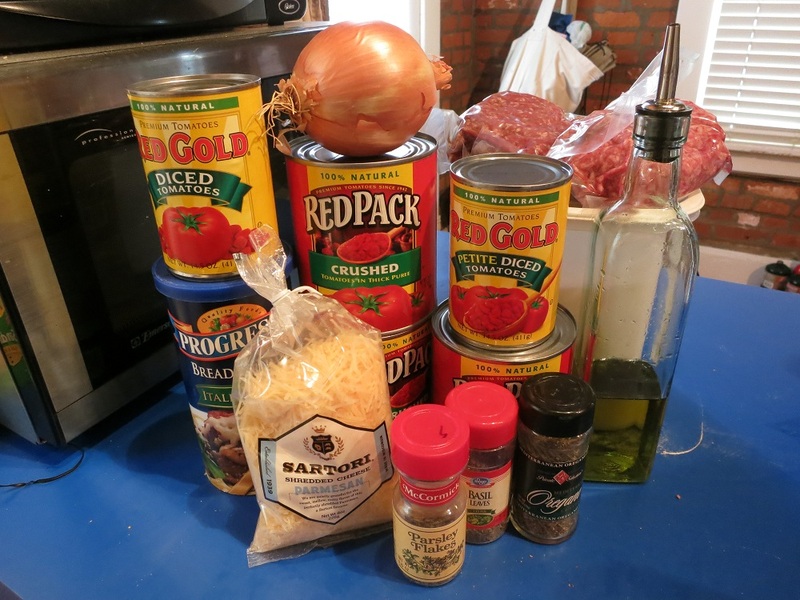 Not only do meatballs really complete spaghetti, but there are usually extras for things like meatball sandwiches. The best way to mix the meatballs all together is with your hands. You’re going to have to get them dirty rolling the meatballs anyway, so why not get started at the mixing stages. I like my meatballs on the smaller size. None of these big as your head meatballs that you sometimes get at restaurants. Roll these meatballs into balls that are slightly smaller than a golf ball. 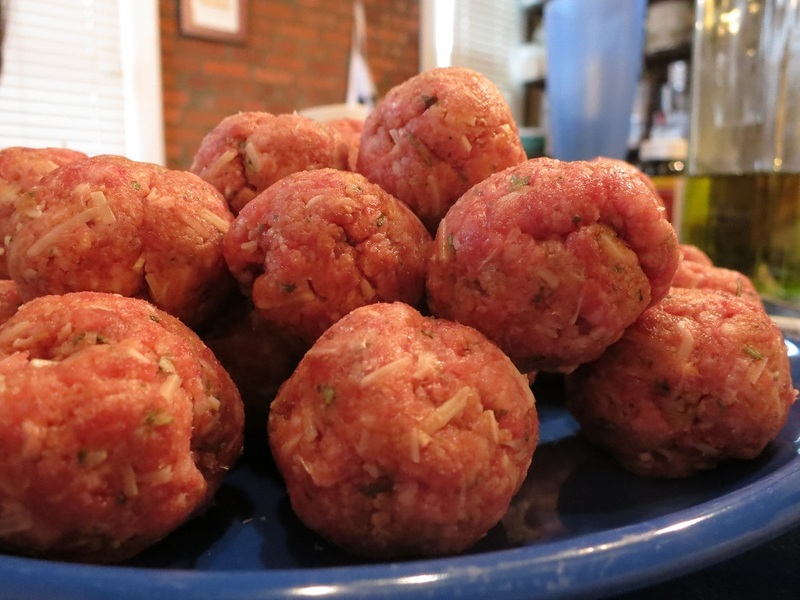 Now, there are many different methods people rely on for cooking of their meatballs. Some swear by pan frying, others choose to bake. I supposed these are all valid options. But they have always seemed a bit foreign and weird to me. 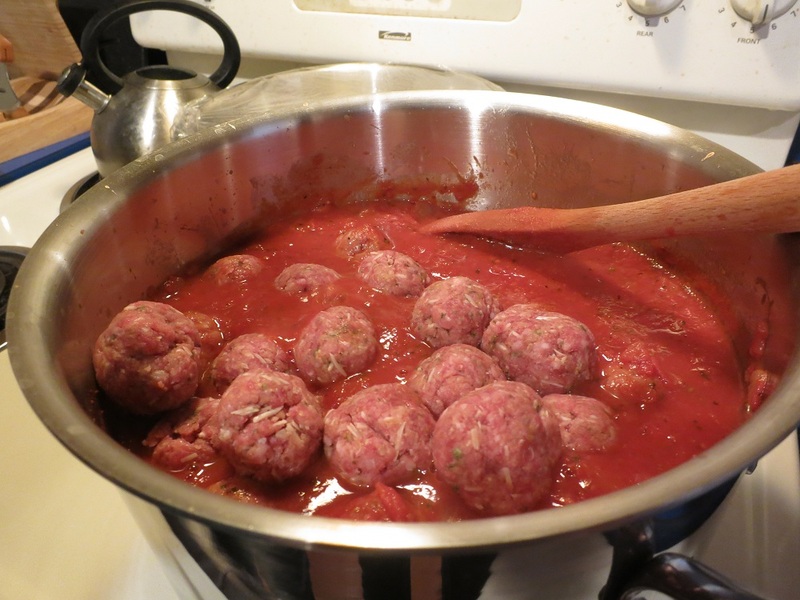 That’s because we always cooked our meatballs in the sauce, allowing it to simmer away for several hours. 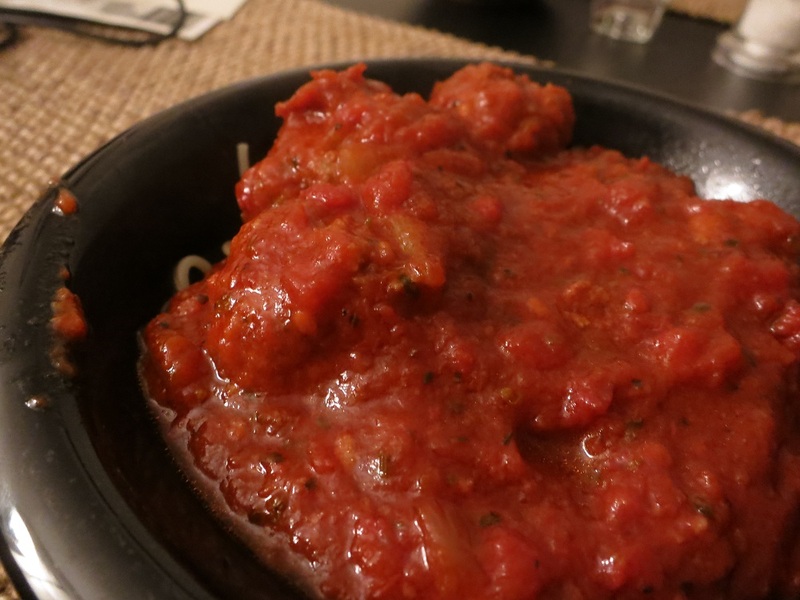 The sauce infuses the meatballs with flavor, and the meatballs in turn do the same to the sauce. It just makes so much sense that when I first realized that not everyone cooked their meatballs this way, I must admit—I was slightly dumfounded. 2. Wait until the sauce is hot, then add the meatballs. 3. Simmer for several (2-3) hours, stirring often enough to keep the sauce from burning. 4. 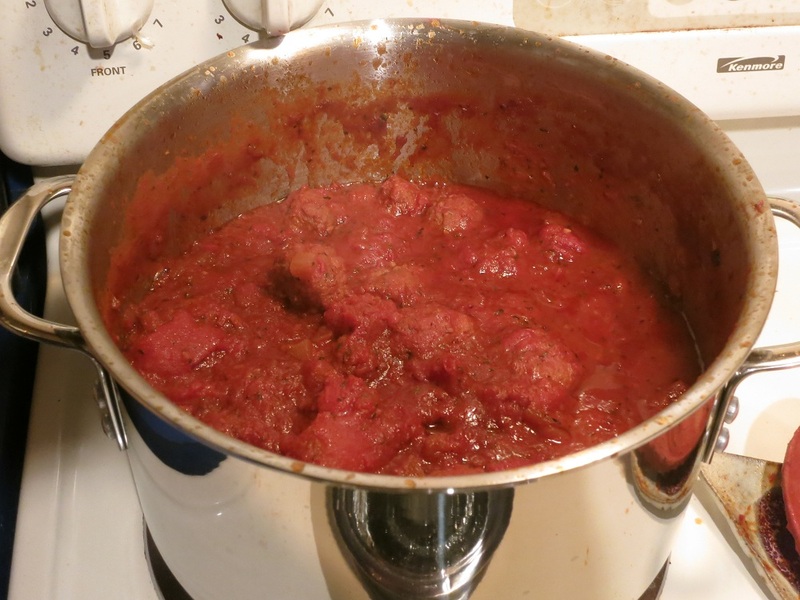 When the sauce reaches the desired consistency, and the meatballs are cooked through, remove from the heat and eat. That’s it. It’s really that simple. I find that when it comes to eating spaghetti, bowls, not plates, are the way to go. I’d be remiss if I didn’t also mention the accompaniment to our meal of spaghetti and meatballs. For Christmas, I received a copy of Peter Reinhart, The Bread Baker’s Apprentice. I’ve been working diligently at learning the techniques he sets out in his book. 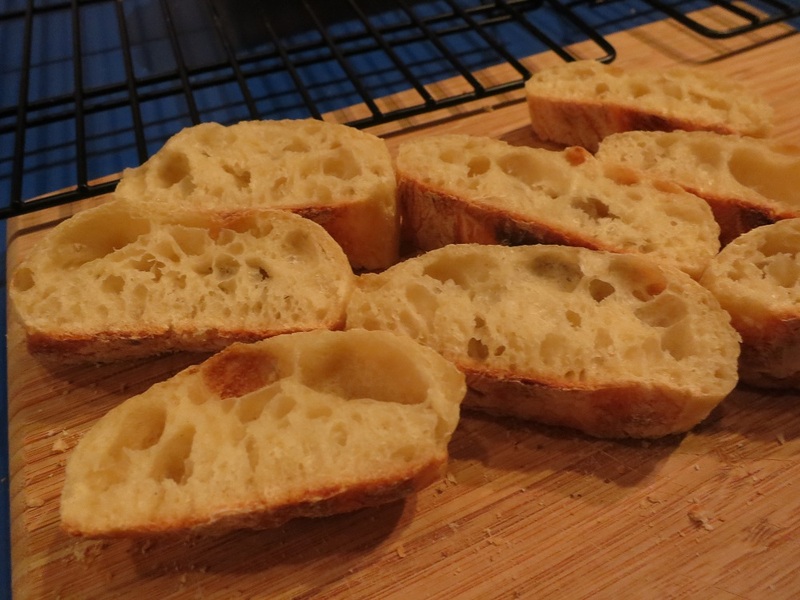 What I’m discovering is that bread baking is a skill—one that you can’t just pick up, but that must be learned over time and with practice. So to go along with our spaghetti and meatballs, I made pain à l’ancienne, one of the most talked about recipes in the book. It also happens to be the first recipe I’ve made that I would even come close to calling a success. Eventually I’ll write about the breads I make. But not until I get a better handle on what I’m doing. Pain à l’ancienne — check out those holes! Looks outstanding! I’ve always pan-seared, then finished meatballs off in the oven, but the last time I made them I skipped the oven and tossed the pan-seared ones into the sauce to finish off. Sooooo much better. I’ll give your method a try next time. Thanks for the interesting post.